Welcome back to Magenta Super Saturday. You can also see my card from today’s post on the Magenta blog here. I love my Zig Cleancolor Watercolor brush pens however I admit that I struggle with getting the shading that I want. Recently I saw a post by Kelly Latevola that inspired me to try her technique for shading and I was so happy with the results. You can see her blogpost here. 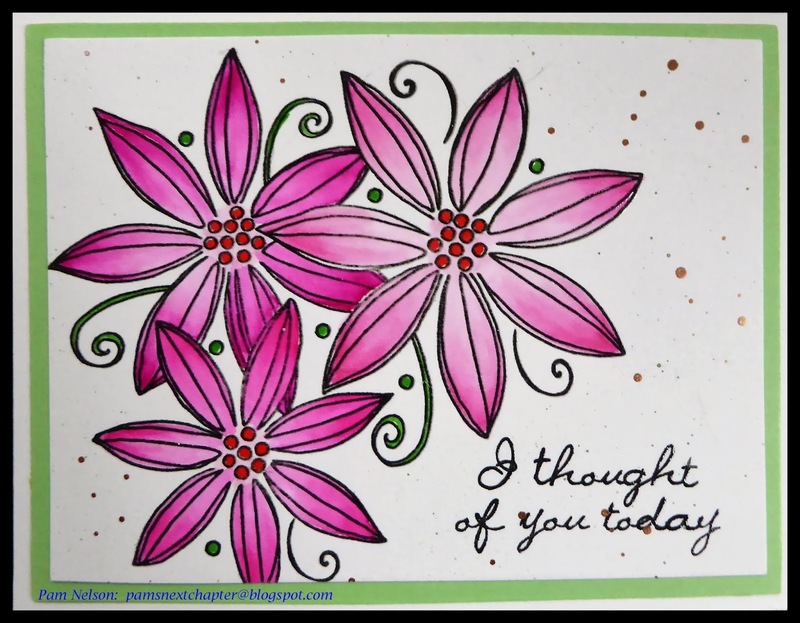 To create this card, I stamped the 3 Poinsettias – 3 Flowers stamp on a piece of Neenah Solar White 110lb cardstock with Gina Kay Amalgam ink. I used Kelly’s technique to color the image with my Zig brush pens. I applied a Sugar Almond Pink from the middle of the petal to the outer end. Next I used a darker color on very end of the petal. 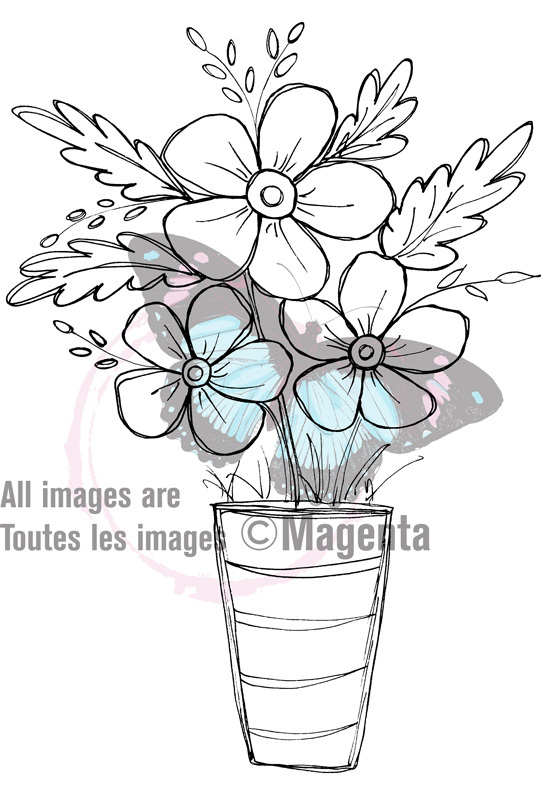 I used a different dark pink on each of the flowers – Peach Pink, Pink or Dark Pink. I applied a very small amount of water with a fine point brush in the center and pulled it toward the color – instant blending! I had some help with this card. My sweet boy Angus likes to keep me company. I used the same process for the other flowers. Where petals overlapped, I waited for the intersecting piece to dry before painting the other petal to avoid any color bleeding. 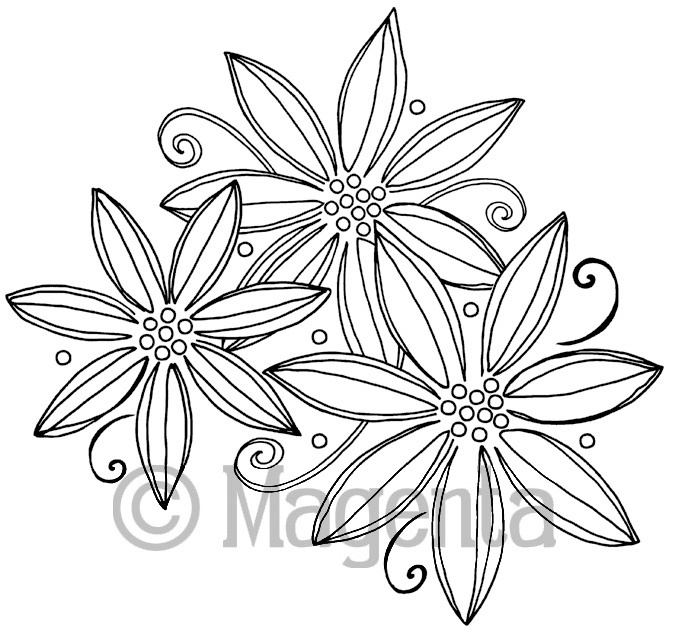 I used May Green on the tendrils and the dots around the flowers and Red on the very center of the flower. After the flowers were dry, I made a mask from the stamp and placed it over the colored image. Next, I splattered gold paint over the open areas. I stamped the sentiment in the lower right corner with VersaFine Black Onyx ink, then embossed with clear embossing powder. I cut the image down, adhered it to a piece of light green cardstock, then adhered it to a white A2 card. I hope you give this technique for the Zig markers a try. Thanks for visiting my blog today! Magenta Super Saturday - Spring is coming! Welcome back to Super Saturday. You can also see today’s post on the Magenta blog here. We’ve received a record-breaking amount of snow in the Pacific Northwest in February. I was snowed in for a few days, so I decided to make a card to remind me spring was coming soon. To create this card, I made a mask by stamping the Potted Flowers on a piece of masking paper and then cutting it out. In my MISTI stamp positioner I lined up the stamp where I wanted it on a piece of 4 ¼” x 5 ½” white cardstock and then placed the mask over that area. Using an ink blending tool I lightly applied Shabby Shutters and Tumbled Glass Distress Oxide inks around the mask – be sure to use a light touch so that you don’t get a ridge of ink that can’t be blended away. I removed the mask and added more ink, overlapping lightly into the area that would be stamped. I added Broken China and a touch of Faded Jeans Distress Oxide ink to the blue part of the background and blended until there was a smooth transition of color. When the ink was dry, I returned the cardstock to my Misti and stamped the Potted Flowers with VersaFine Black Onyx ink. When the ink was dry, I colored the image with colored pencils (the colors are listed below.) I returned it to my MISTI one last time, stamped with VersaMark ink, then embossed with clear embossing powder. Lastly, sprinkled a bit of water over the blue inked area. I trimmed the image down and matted it to a piece of black cardstock and then to a piece of purple cardstock before adhering it to a white, A2 card. I added a few clear Nuvo drops on the petals and leaves. For the sentiment I shaded a piece of white cardstock with Tumbled Glass and Shabby Shutters Distress Ink. When the ink was dry, I stamped the sentiment with VersaFine Black Onyx ink and embossed with clear embossing powder. I trimmed the sentiment down and added it to the card with a piece of foam tape for some extra dimension. Welcome back to Super Saturday. I need to make a bunch of birthday cards for family and friends who have birthdays in the coming weeks. 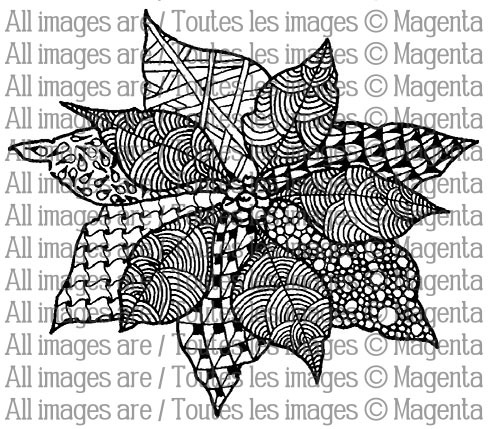 You can also see my card on the Magenta blog here. 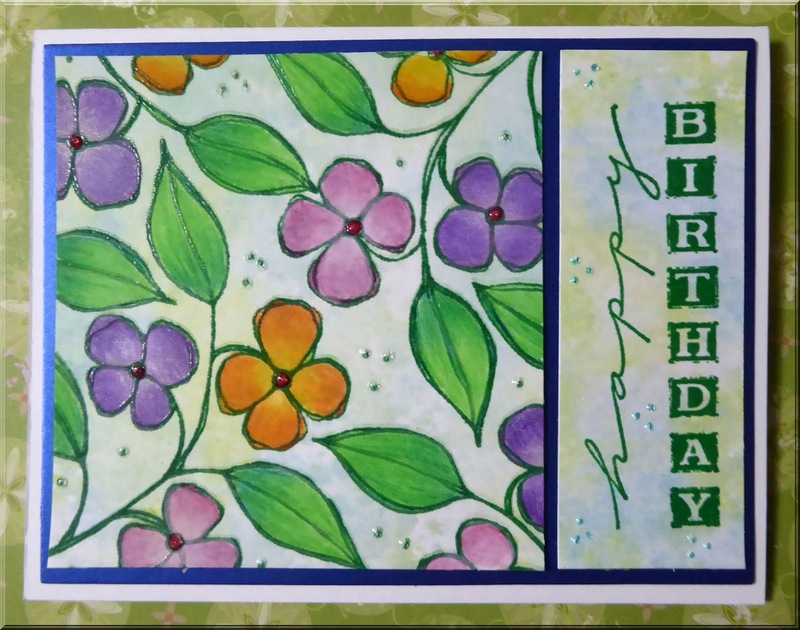 I have always loved the vertical Happy Birthday stamp so I paired it with the Floral Tile stamp to create this card. I patted light colors of Distress Oxide inks on my craft mat (Antique Linen, Tumble Glass and Bundled Sage) and sprayed liberally with pearly water (Perfect Pearls mixed in water.) I dabbed two pieces of heavyweight white cardstock onto the ink, dried it with my heat gun and repeated until I had the coverage I wanted. I did both pieces at the same time because I wanted the colors to be similar on both. When the cardstock was dry, I used my MISTI and VersaClair Oasis Green ink to stamp the cardstock with the Floral Tile stamp. I colored the images with a variety of Prismacolor pencils, then returned it to my MISTI in the same position. I stamped again with VersaMark ink and embossed with clear embossing powder. I stamped the happy birthday on the second piece of cardstock and embossed with clear embossing powder. I trimmed the pieces down and adhered them to a piece of Fair Blue So Silk cardstock and then to the front of an A2 card. I added a few accents with Nuvo Morning Dew drops. Welcome back to my blog and Magenta Super Saturday. Recently I’ve been making lots of Valentine’s Day cards for a project at my church so I thought I’d share one of them with you today. 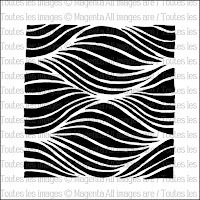 I used the Wavy Texture stencil and Heart Burst stamp. Magenta has so many great heart stamps that work so well for Valentines that it was hard to choose one. 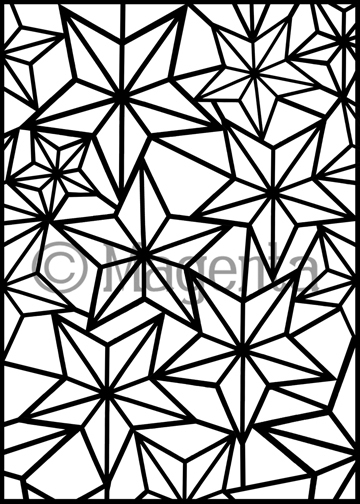 You can also see this card on the Magenta blog here. I taped the Wavy Texture stencil to a piece 5” x 3 ¾” Kraft cardstock so I could run it through my Big Shot. I used Tab 1 of the main plate, then a cutting plate, the rubber pad, then the paper and stencil (with the stencil on top) then another cutting plate. You may need to experiment with your machine until you get the right amount of thickness. After running this through the Big Shot you can see the impression of the stencil on the paper. Before removing the paper from the stencil, I patted a VersaMark pad over the surface. I removed the stencil and covered the surface with Wow Pearl Gold Sparkle Embossing Glitter. I stamped the Heart Burst with VersaFine Clair Glamorous (Red) ink on a piece of 2 1/8” x 2 1/8” square of Kraft cardstock, then embossed with the same embossing powder. I stamped with the red ink so that the heart would stand out a bit more on the Kraft cardstock. I ran the edges of the square along a VersaMark pad and then dipped each edge in the gold embossing powder and heat set it. This provides just a touch of gold sparkle along the edges. To assemble, adhere a piece of 4 1/8” x 5 3/8” red linen to the front of an A2 Kraft card, then adhere the embossed piece on top. 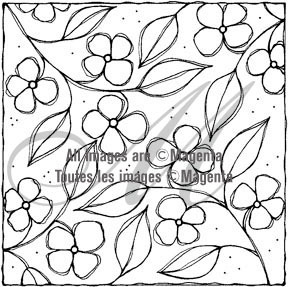 Adhere the heart image to a 2 ¼” x 2 ¼” square of red linen. Apply a piece of Fun Foam to the back. To finish the card, tie a bow with gold twine, adhere it to the Fun Foam and then adhere it to the front of the card. I love embossing with stencils because of the great texture it adds to a card. I hope you will give it a try. Thanks for visiting my blog today! Welcome back to my blog. I hope that your new year is off to a great start. I have a fun card for “Super Saturday with Pam” which you can also see on the Magenta blog here. The technique for this card uses alcohol ink and watercolor paper. I saw it on Jennifer McGuire’s blog and you can see her video here. She mentioned that she’s been using the technique for a long time so perhaps this technique won’t be new for you. With this technique you can make several pieces very quickly so I thought it was perfect for making a bunch of thank you cards. To start I taped the Magenta “All Over Stars” stencil to a piece of Tim Holtz watercolor paper. I like the Tim Holtz paper for this technique because it is bright white. I used a VersaMark ink cube to cover the front of the paper with ink. I removed the stencil then covered the inked areas with clear embossing powder and heat set the powder. If you watch Jennifer McGuire’s video you will see that she tries other colors of embossing powder. I did that too and have some pictures of those pieces at the end of this post. I applied alcohol ink (Patina, Turquoise, Sailboat and a small amount of Silver Mixative) to a felt applicator along with a generous amount of blending solution. The watercolor absorbs the ink and blending solution quickly so if the colors isn't moving around like you want, apply more blending solution to your applicator. I pounced the color all over the watercolor paper until the whole card front was covered. (For a different look, rather than pouncing the color, you can also brush the color in even, back and forth strokes over the card panel.) The embossing powder acts as a resist so some of the white paper will show through from beneath the embossed area. Also, some of the color will sit on top of the embossed surfaces. To finish off the card, I used a 2 ½” oval die from the Hero Arts Nesting Ovals set to cut out the center of the stenciled panel and to also cut a piece of silver metallic cardstock. 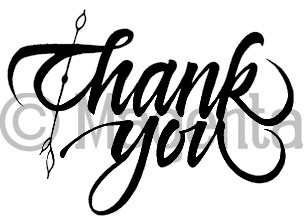 I stamped the medium “Thank you” with VersaMark on a piece of white cardstock and embossed it with Wow Metallic Silver Sparkle embossing powder. I die cut this with a 2 ¼” oval die from the same set and also used the same die to cut a piece of fun foam. I adhered the stenciled panel to the front of an A2 card. Then I adhered the fun foam oval to the back of the silver paper, then adhered the sentiment on top and positioned it on the card. I added a few clear gemstones in the center of each star for a bit more shine. I couldn’t stop playing with this technique so I tried it with a few other stencils and ink colors. It’s fun to experiment with how the ink is applied as well different colors and combinations of alcohol ink and embossing powders. I'll list the stencils and embossing powders below. The only down side to this technique is that it doesn’t photograph well. The camera just can’t pick up all the shine that you get with this technique. I hope you will give it a try to see it in person. Thanks for visiting my blog. All the best to you in the coming year. Welcome back to my blog. I know this is a busy time of year but I hope you have had some time for fun, also. 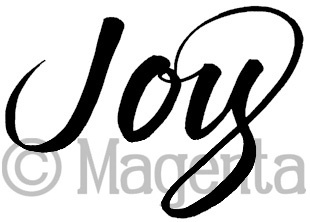 The Magenta Design Team has a treat for you today. Everyone collaborated on a joint post of Christmas cards which you can see here. 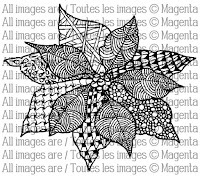 For the card I contributed to the post, I used the Magenta Poinsettia Border stamp. I this is one of my favorite stamps from their 2018 release. 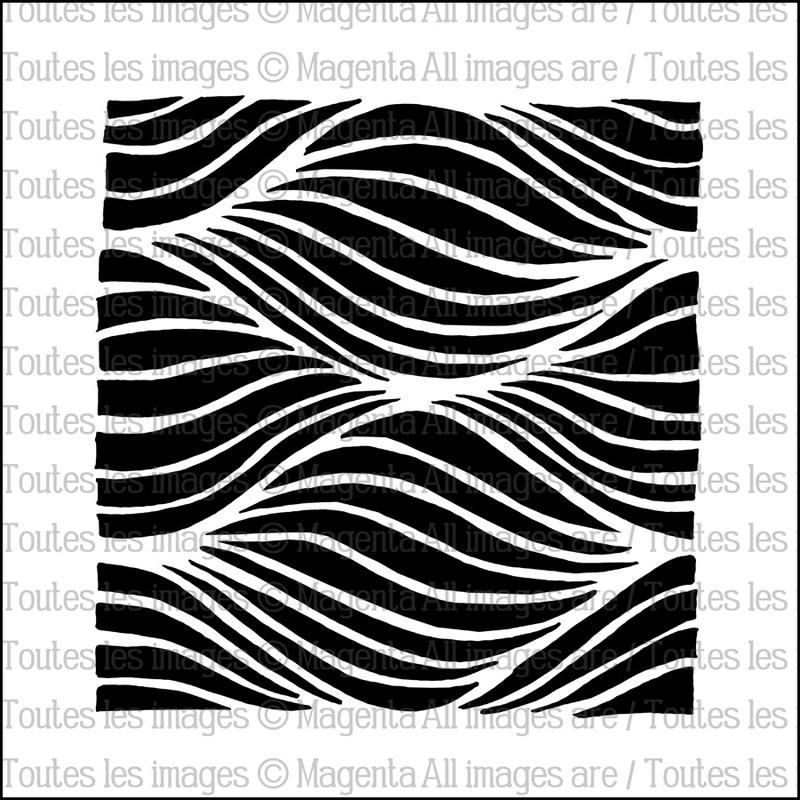 I cut a piece of Kraft cardstock to 4” x 5 ¼” and placed it in my MISTI. I positioned the stamp so it was aligned near the top of the cardstock, then stamped with VersaFine Toffee ink. I rotated the cardstock 180 degrees and stamped along the bottom edge of the cardstock. I left my stamp in my MISTI as I planned to restamp the images after I finished my coloring. Next I colored the images with Prismacolor pencils. When the coloring was complete I put the cardstock back in my MISTI and used an anti-static tool over both images. I restamped both borders using VersaMark ink and then embossed with detail gold embossing powder. I stamped the sentiment with VersaMark ink and then embossed with Judikins Cherry Twinkle embossing powder. I layered the image over a piece of green cardstock and then to an A2 card. I stamped several images of the Poinsettia Border on both Kraft and white cardstock and then used them on different cards. I followed the same technique as above – stamp, color with Prismacolor pencils, then restamp and emboss. 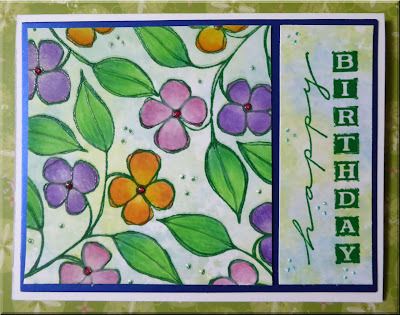 For this card I stamped on Kraft cardstock, colored the image then restamped with VersaFine Clair Green Oasis ink. I embossed with clear embossing powder. I used the My Favorite Things Vertical Stitched Strips to cut the panel. Unfortunately, I found out after I completed my cards that this die set has been discontinued but you can just trim the panel to size with a paper trimmer. I adhered a piece of fun foam to the back to provide some added dimension to the finished card. 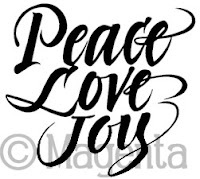 I stamped “Peace, Love, Joy” with VersaMark on a piece of green cardstock, then embossed with detail gold embossing powder. I adhered the green cardstock to an A2 card and then adhered the stamped image to the green cardstock. I created this card the same way, but used a sentiment from Hero Arts Merry Christmas Messages, CL722. For my last card I stamped on white cardstock and after coloring I restamped with VersaMark and embossed with detail gold embossing powder. I cut two panels – one with the Poinsettia Border and another for the sentiment. Rather than using fun foam, I cut strips of gold metallic paper slightly larger than both strips and adhered the white strips on top. I adhered both pieces to a piece of green cardstock that I had already adhered to an A2 card. I really am a big fan of this stamp. I think it could also be colored with a variety of colors so it could work for year round cards. Thanks for visiting my blog. I hope that you and your loved ones have a wonderful Christmas and a New Year filled with happiness, peace and good health. Welcome back to my blog. I have a fun card for “Super Saturday with Pam” which you can also see on the Magenta blog here. 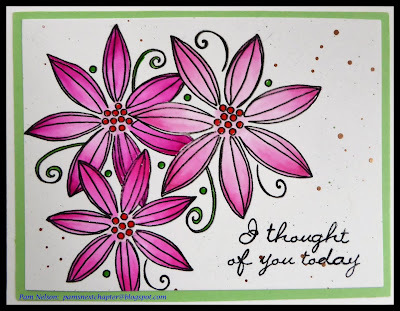 Today I made a card that features one of my favorite Magenta holiday stamps, the Doodled Poinsettia. It was designed a couple of years ago by my good friend and fellow Magenta design team member, Dianne Johnson. 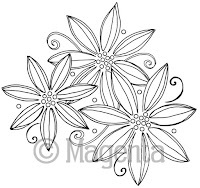 I stamped the “Doodled Poinsettia” on a piece of Neenah white cardstock using VersaMark and then embossed it with gold detail embossing powder. Next, I colored it with Tombow markers 703,757, and 847. I started with the lighter color in the center moving out to the darker colors at the outer edges. After the markers dried, I colored over the poinsettia with a Wink of Stella pen for some added shimmer. I used a 3” circle die to cut out the image. I also cut a 3 ¼” circle from gold metallic cardstock, then placed the poinsettia on top. 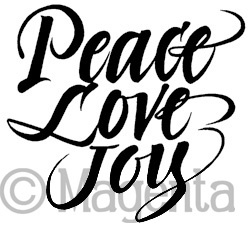 I stamped “Peace, Love, Joy” with VersaFine Clair Green Oasis ink then embossed with clear embossing powder on a 4” x 5 ½” piece of Neenah white cardstock. I created a mask of the sentiment by stamping on a Post-it note and cutting it out. I placed the mask over the stamped sentiment and then splattered red and gold paint on it. Before it dried I covered the panel with Iridescent Sparkle embossing powder and heat set it. You must do this right away for the embossing powder to stick but it adds so much sparkle to the front of the card. You can really see the sparkle in person but unfortunately it doesn't photograph as well. For the embellishment in the center I stamped “Joy” on a piece of clear shrink plastic with green Stazon ink, cut it out and then heated with a heat gun to shrink it. You want to cut as closely to the stamped image as possible, however on clear plastic the background disappears once you put the embellishment on the card. To assemble the card, I adhered a piece of 4 ¼” x 5 ½” green textured cardstock to the front of an A2 card. I wrapped some gold twine to the bottom of the white panel and adhered that to the front of the green panel. I adhered the poinsettia to a 3” circle of fun foam and adhered it to the card. I used a couple of glue dots to adhere the Joy embellishment in the center of the poinsettia. Then I added a few jewels for a bit more bling. Thanks so much for visiting my blog. I hope you have a wonderful holiday season.